The Big Wobble: Gates of hell open in Northern California! 10 dead and 20,000 people flee in response to some of the state's worst-ever wildfires. Gates of hell open in Northern California! 10 dead and 20,000 people flee in response to some of the state's worst-ever wildfires. A state of emergency was declared in northern areas after mass evacuations, with 1,500 properties destroyed. About 20,000 people fled from Napa, Sonoma and Yuba counties in response to some the state's worst-ever wildfires. A rapidly spreading brush fire that began in the Anaheim Hills area has burned multiple homes and threatened others, prompting road closures and evacuation orders that impacted 5,000 residences in Anaheim, Orange and Tustin on Monday. 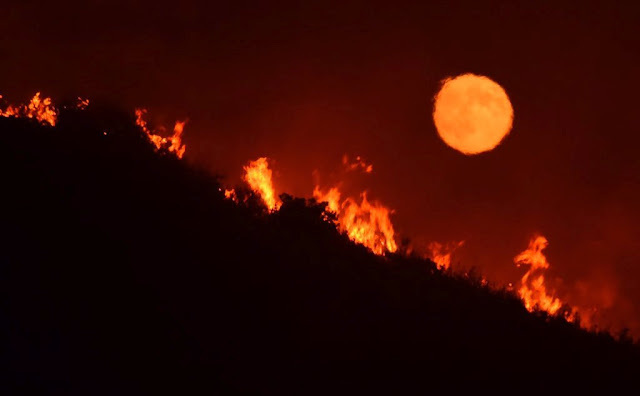 At least 4,500 acres have burned in the so-called Canyon Fire 2, which remained 0 percent contained by mid-afternoon. A fire burned in the same general area on Sept. 25, when 2,662 scorched at the edge of Anaheim and Corona. Firefighters are scrambling to save homes as a wildfire explodes in size in Yuba County. The fire started near the community of Loma Rica Sunday night, near Willow Glen Road and Marysville Road. The wildfire quickly grew to at least 5,000 acres. At one point, Cal Fire said the blaze was spreading at a rate of 1,000 acres per hour. The fire has already destroyed and damaged several homes and buildings, according to Cal Fire. One resident told KCRA he drove around the area and saw dozens of homes and structures damaged by the flames. Highway 20 between Marysville Road and Grass Valley is open and available as an evacuation route. Gov. Jerry Brown declared a State of Emergency due to the wildfires in Napa, Sonoma and Yuba counties. Wind-whipped wildfires roared to life Sunday night and early Monday across Wine Country, burning building, forcing evacuations and injuring several people. The Atlas Peak fire was the largest of several wildfires, quickly growing to more than 200 acres near Napa. Meanwhile, the fire near Calistoga had burned several buildings and sent several people to the hospital to be treated for burns. Cal Fire said firefighters were battling several blazes in Sonoma County. The fires had stretched Sonoma and Napa counties firefighting resources to the breaking point. Wind gusts were predicted to be in the 30 mph range in the area of the fire. The rapidly moving Atlas Peak fire was visible throughout Napa Valley and heavy smoke was draping over the region. Cal Fire said the blaze broke out on Atlas Peak Road just south of Lake Berryessa at 9:50 p.m. Authorities said the blaze was quickly moving toward the Silverado Trail - an area dotted with homes and wineries. The Napa Valley Register was reporting that authorities were going house to house just north of Silverado Resort urging residents to leave. A large plume of smoke from the fire drifted as far south of San Francisco and the East Bay where residents were reporting the strong smell of smoke in the air. For a long time Napa Valley residents the massive fire rekindled memories of the 1981 Atlas Peak wildfire. In that blaze, 23,000 acres were burned, $36 million was done in damage, 65 structures were destroyed and 11 people were injured. One out-of-control blaze in and around northern Santa Rosa called the Tubbs Fire had burned at least 20,000 acres by 8 a.m.
Scores of homes were lost in the Fountaingrove area east of Highway 101 and in the Journey's End Mobile Home Park on Mendocino Avenue. The Fountaingrove Inn across the street from the mobile home park burned, as did the Hilton Sonoma Wine Country, a Kmart store, a McDonald's, an Arby's, an Applebee's and a Mountain Mike's Pizza. And that was just the beginning. Residents in the area described fleeing for their lives in the middle of the night from the fire, in cars or on foot. Hundreds of firefighters were on scene.